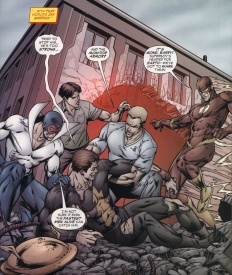 The speed force transported them all, along with Wally and his family (maybe—see below), to an alternate Earth. Along with that world’s Jay Garrick, they imprisoned Superboy in a building in Keystone City surrounded by machines that generated red sun energy (Flash: TFMA #6, 2007). Four years later, Superboy escaped, and Bart followed him back to the main DCU. Because time flows differently in the two universes, only a matter of hours or days had passed for the rest of the DCU. Contradicting Bart’s memories, it appears that the Wests spent their missing year on an alien planet (Flash v.2 #231, 2007). It could be that Bart’s memories were inaccurate, or that their fate was rewritten in the creation of New Earth, and Bart, true to form, remembered the previous version of events. Little else is known of this dimension, including its fate after the events of Infinite Crisis. Flashes: Flash: The Fastest Man Alive #6 (January 2007) - Andy Smith and Art Thibert. References to the Flash discovering another Earth in Justice League of America. The Earth-2 Superman and Wonder Woman being pulled somewhere in the collected edition of Infinite Crisis. The presence of a younger Jay Garrick in the flashback in Flash: The Fastest Man Alive #6. Several months later, 52 Week 52 revealed the existence of a new multiverse, with a new Earth-2 very much like the original, but it is not clear whether the universe seen in the flashback is the same. Additionally, the Flash shown in the officially-named Earth-2 wears a slightly different costume, though super-heroes have been known to change their costumes from time to time.